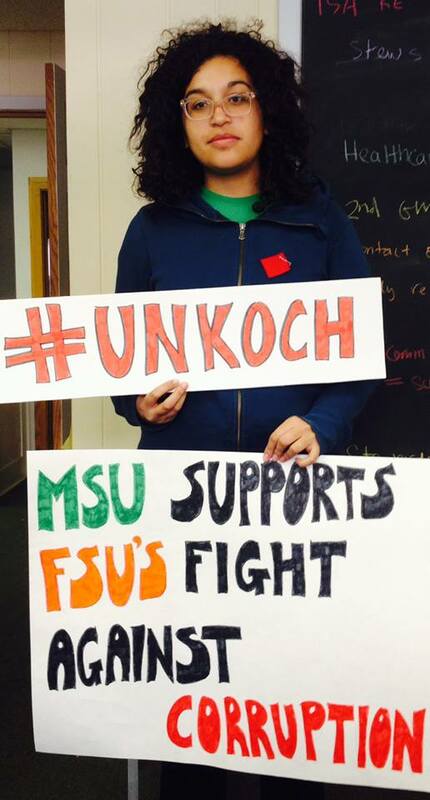 As students in Michigan, Kansas and Virginia attempt to pin down evasive administrators to review grant contracts cut between billionaire Charles Koch and their universities, one campus is working to tie these regional movements together. 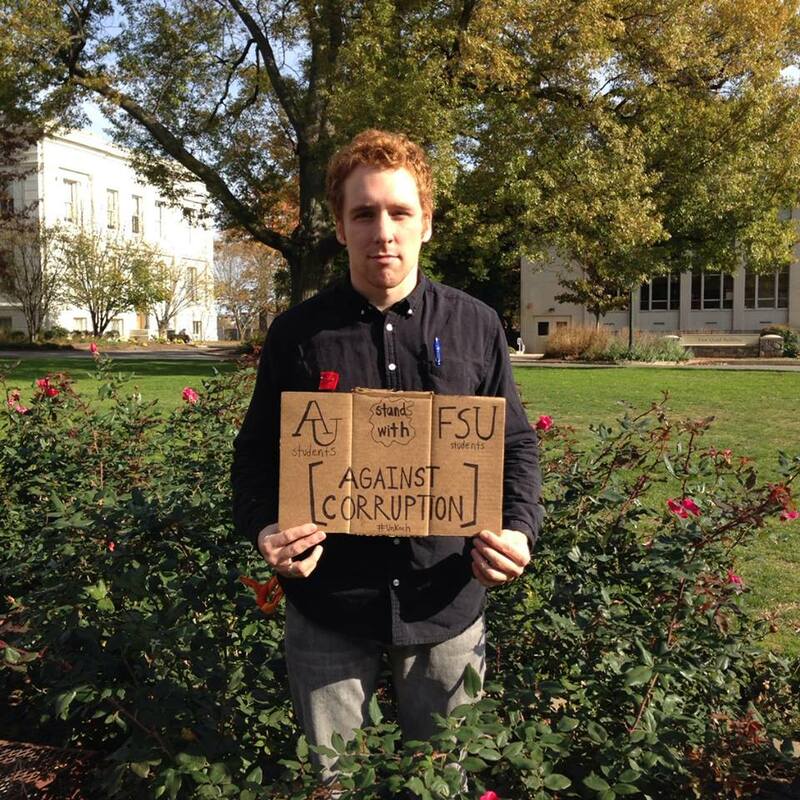 Florida State University (FSU) students affiliated with the group FSU Progress coordinated various student groups at 20 campuses across the U.S. to push back against corporate donors who use money to weave their interests into the mission of universities: educating students. 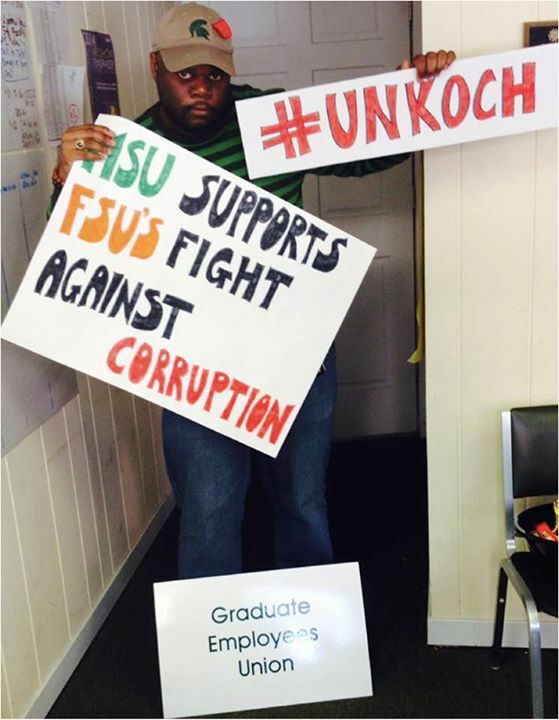 “Mondays event, though, focused on the wider issue of “corporatization of higher education” and homed in on state Sen. John Thrashers appointment last month as president. He was approved despite strong objections from students and faculty members. 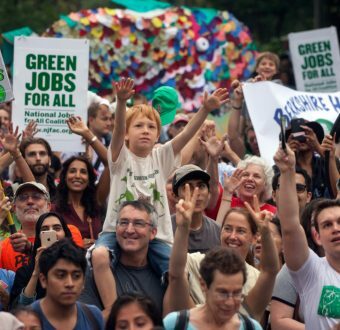 “Thrasher also was chosen multiple times as legislator of the year by the conservative, Koch-supported American Legislative Exchange Council, Lakey said. And Allan Bense, chairman of the universitys board of trustees, is also chairman of the board of directors of the James Madison Institute, a Koch-funded think tank. 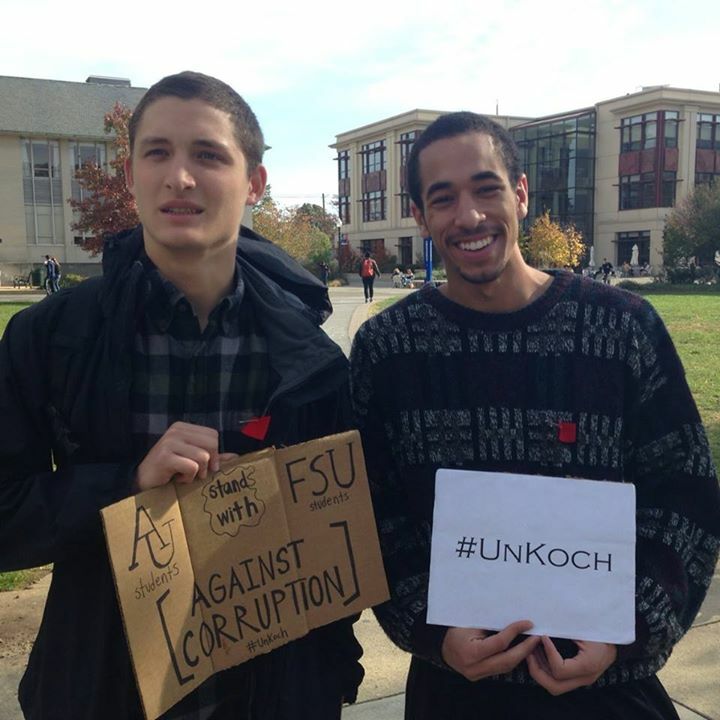 George Mason University is by far the largest university benefactor of Koch money, receiving $24 million from 2005-2012, excluding tens of millions of dollars from Koch to two Koch-governed think tanks on campus. 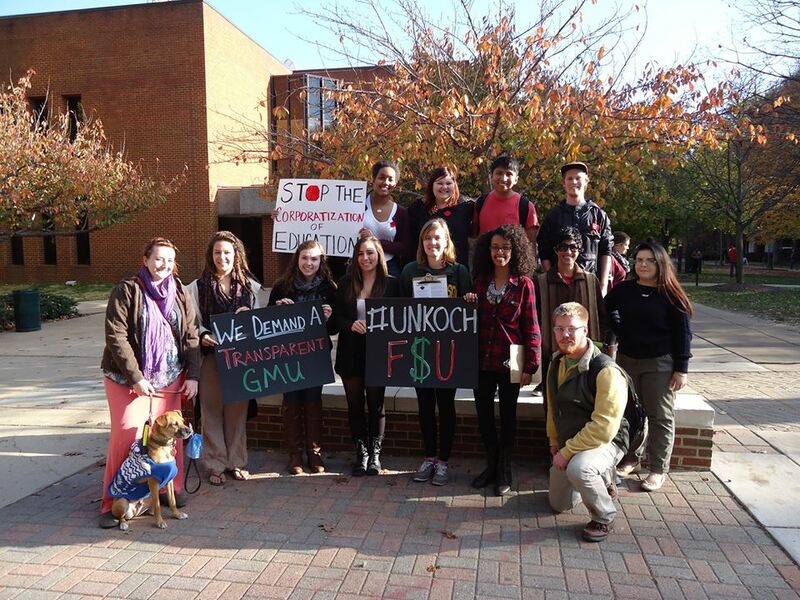 GMU student protestors petitioned their fellow students to help grow pressure on the GMU administration, which has so far failed to provide the transparency needed to prove to it students and professors that Koch money isn’t exerting influence in the classroom. Photo below. Students at University of Kansas are awaiting the results of an open records request submitted in September, which their administration charged them $1,800 for. 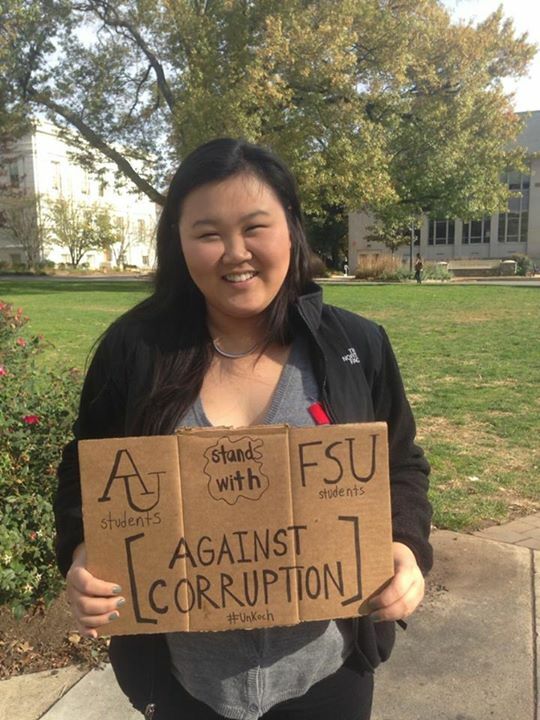 After making their case in a public op-ed in the Lawrence Journal-World, public supporters helped KU students raise the money needed to get documents relating to former Koch-lobbyist Art Hall who now runs a project in KU’s business school with Koch grants. Its impossible to tell whether strings are attached to this donation. The University has declined to disclose if there were any conditions that came with accepting the money. 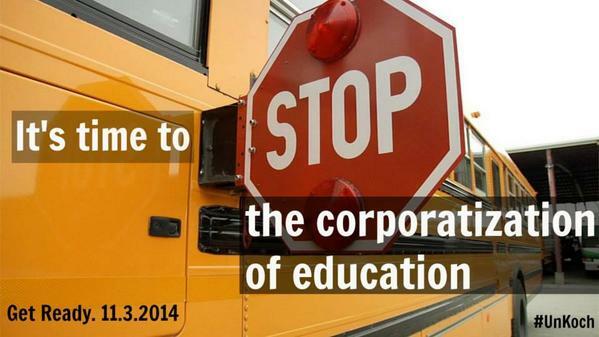 Koch is now noticing this nationwide revolt. In response to student protest, the Charles Koch Foundation just created “academic giving principles” that aim to gloss over the documented cases in which academic freedom took a back seat to Mr. Koch’s preferences. This is consistent with the activities of Mr. Koch: micromanage the things you fund, and use fancy words to obscure what you’re actually doing – in this case meddling with the education of high school and college students. 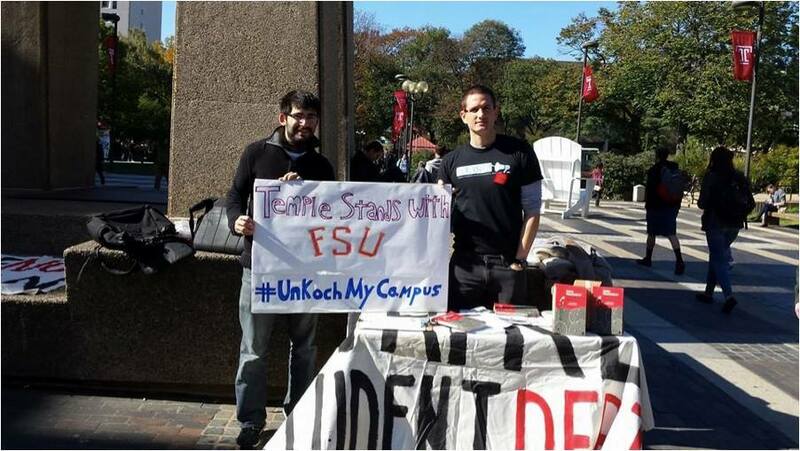 Charles Koch cannot hide his assault on academic freedom with words. Mr. Koch is attempting to buy a constituency which is actively developing its ability to think critically. Students and professors are asking the right questions, and Koch-funded university administrations aren’t helping by behaving in secretive ways. The primary suspect in examining nationwide attacks on academic freedom is billionaire Charles Koch. 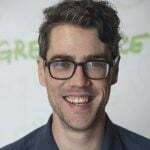 Greenpeace has documented that what little is known about the $50 million Koch sent to universities from 2005-2012 puts Mr. Koch’s corporate ideologies ahead of the ability for faculty to teach concepts freely.